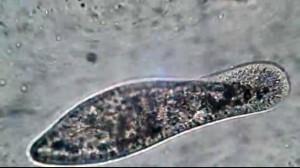 Paramecia are single-celled organisms, belonging to the group of protozoa. They are covered with cilia, which beat and move the cell in the water. Diluted milk was added to the sample to make the water movement visible. This is a very beautiful demonstraton: thank you! !